Have I mentioned lately how much I love Ina Garten? Really, I do. She has that librarian voice that can make a person go from nutso to calm and collected, in seconds. I received Barefoot Contessa, Back to Basics for Christmas and it’s quickly becoming a household classic. 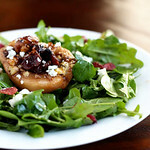 One of the first recipes that I bookmarked was the Roasted Pears with Blue Cheese salad. 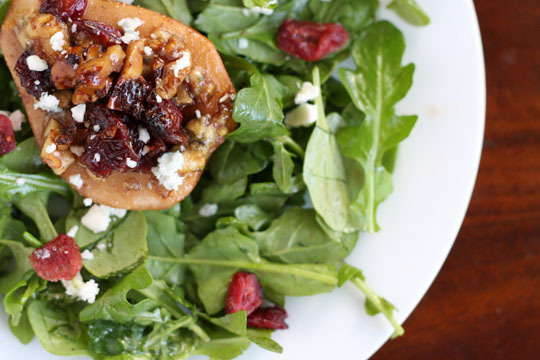 Pear halves, roasted with port, blue cheese, walnuts, and cranberries are served over a bed of greens… it’s every bit as good as it sounds. I really love salads. Mix up the greens, cheeses, dried or fresh fruits, nuts, grilled veggies, crispy bacon or fancy pancetta, warmed dressings… We’re talking a long way from the iceberg, tomato, and ranch dressing salads we grew up with. Whatever is in season and whatever is in the fridge goes in a big ol’ bowl. And then I plop down in front of the TV to catch up on One Life to Live with the big ol’ bowl in my lap. And apparently other people love salads, too. I took a peek at our site stats and “salad” is one of the top ten search keywords so far this month. If you are one of those Salad Seekers, have I got a great recipe for you! 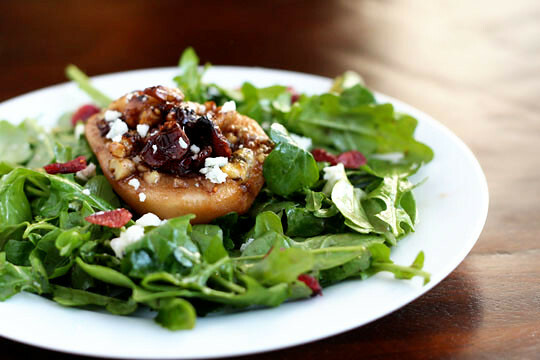 An beautiful fall salad with pears, walnuts, and bleu cheese. Peel the pears and cut in half length-wise. Use a melon baller to remove the cores and seeds. Cut a small slice away from the rounded side of each pair to keep it steady when filling and baking. Toss the pears with lemon juices and arrange them core side up in a baking dish. Toss the blue cheese, cranberries, and walnuts together and divide among the pears. Combine apple juice, port, and brown sugar, whisking together until sugar dissolves. Drizzle over and around the pears. Bake the pears, basting every 5-10 minutes with the apple-port mixture, until tender (about 40 minutes in my oven). Remove and let cool to warm or room temp. Whisk together the olive oil, lemon juice, and 1/4 cup of the basting liquid. Toss with the arugula and divide among 6 plates. Top each salad with a pear half, season with salt and pepper. Ina Garten is definitely one of my top-favorite Food Network chefs/hosts – she’s fabulous!! I could not love Ina more if you paid me. I love that even if I have a table full of important company to impress, I can make one of her recipes for the first time and trust it will turn out well. I’m cooking my way through Back to Basics this year and haven’t reached this recipe yet, but I’m sure it will be delicious! I LOVE pears! This looks delicious! I have to admit, I love salads also. Especially salads like this. This looks amazing! I agree with you that salads aren’t punishment! Love your blog! I read it all the time! I love salads like this. I am a Ina fan also. You may want to check out this website where people join and blog through her recipes together. Thanks for this review! That was one that I had bookmarked in the book also! Wouldn’t you love to live like Ina? That house! This salad looks amazing, and I’m guessing tastes even better. Thanks for sharing! P.S. I’ve tagged you for a blog award… I have you on my Google Reader and LOVE your blog! This looks scrumptious! Thanks for sharing this recipe, I find it so hard to come up with a good green salad in the winter! whenever my sister makes potato salad, i always eat them in less than a minute or so he he. i just love all sorts of salad. :-.